Far From Afghanistan (John Gianvito, Jon Jost, Soon-Mi Yoo, Minda Martin, Travis Wilkerson, 2012), is not only in its title, but also in its approach inspired by Far from Vietnam. Co-director and c0-programmer John Gianvito will explain in a Q&A following the screening. The part of Loin de Vietnam / Far from Vietnam made by Joris Ivens, was mainly based on footage shot on location by Marceline Loridan-Ivens in North-Vietnam. Also the long documentary they both made at the war front of the 17th parallel in Vinh Linh will be screened. Fans of marathon cinema won’t want to miss La Commune (Paris, 1871). The incredibly ambitious study of the 1871 Paris Commune’s rise and fall is documented in this 345-minute film. Another highlight is Occupy Wall Street and Beyond, a collection of shorts that were shot in and around the famous protests at Zuccotti Park. This footage includes newsreels shot by filmmaker Jem Cohen, as well as films by the Newsreels activist collective of the ‘60s and the Workers Film and Photo collective of the ‘30s. The screening will be followed by a panel discussion. Join us in experiencing these powerful films of political activism and resistance! Tickets to Cinema of Resistance will go on sale on Thursday, July 25. See three films or more and save with our discount package. On the border of North and South Vietnam, civilians live underground and cultivate their land in the dead of night, farmers take up arms, and bombs fall like clockwork. Joris Ivens and Marceline Loridan’s record of daily life in one of the most volatile regions of a war-torn, divided country is both a hazardous piece of first-hand journalism and a shattering work in its own right, simmering with barely repressed anger. “Nothing comes to a sleeper but a dream.” Firestone’s document of the 1971 Attica Prison uprising ended with a wake-up call in favor of penal reform—and then went out of circulation for 33 years. Restored in 2007, Attica details the inhuman living conditions and routine abuses that led thousands of prisoners to seize control of the Attica Correctional Facility. The film sheds light both on a shameful episode in the history of the US prison system and on a pivotal moment in the course of civil rights. ATTICA courtesy of the Reserve Film and Video Collection of The New York Public Library for the Performing Arts. Preservation of this film was made possible by a grant from the Women’s Film Preservation Fund of New York Women in Film and Television. 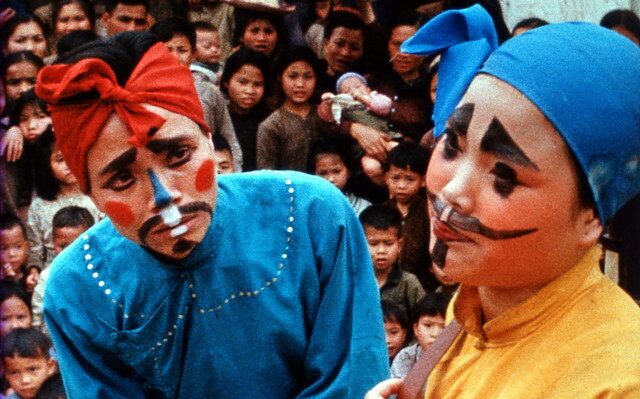 A lineup of international New Wave luminaries responded to Vietnam, in the words of contributor William Klein, “a little like Picasso confronted by the bombing of Guernica.” Klein’s New York street footage accompanies frontline dispatches from Joris Ivens and contributions from a quartet of French icons (Godard, Resnais, Varda, Lelouch). As edited by Chris Marker, these fragments coalesce into a splintered portrait of a Left consumed with shock and complicity over a conflict beyond its control. An Icarus Films release. Vietnam consists of five brief vignettes (each the work of a different director) focused on guilt-ridden troops, shattered families, and detached Americans, interspersed with on-the-ground interviews with Afghan civilians. Far From Afghanistan depicts a nation blind to the longest war in its own history, and a soldiery trained to follow orders whose basis and justification remain unknown. The Occupy Wall Street demonstrations, for all their 21st-century trappings, belong to a long lineage of grassroots protest movements and social uprisings. The same goes for the film and video documents that emerged from OWS. Organized in collaboration with Occupy Cinema, a collective that presented screenings at Zuccotti Park and staged their own moving-image interventions, this program presents several observational shorts shot in and around the protests — including newsreels by filmmaker Jem Cohen (Museum Hours) — alongside a selection of kindred historical documents, including films by the Newsreel activist collective of the ’60s and the Workers Film and Photo League of the ’30s. At once a treatise, a manifesto, an essay film, a history lesson, a poem and a battle cry, The Hour of the Furnaces is a classic of revolutionary cinema. Shot under the watchful eye of Argentina’s then-reigning military dictatorship in the early stages of the country’s “dirty war” and edited at a breathless fever pitch, the film functions as a sprawling history of Latin American politics, an incendiary discourse on the evils of neocolonialism, and a passionate defense of violent action in the face of extreme injustice. Alanis Obomsawin’s exhaustive documentary concerns a centuries-old land dispute in Oka, Quebec. In 1990, the Mohawks of Kanehsatake, already relegated to a slim reservation and denied any claim to the surrounding land, learned of plans to further restrict their territory in favor of an expanded, members-only golf course. They resisted. Obomsawin watches the resulting summer-long standoff from inside the Mohawk barricades, documents the community’s daily life, records their internal debates, and celebrates their unwavering commitment to a never-ending struggle. MacCaig’s thoughtful, probing analysis of Northern Ireland in the throes of revolution recasts what had long been deemed a religious conflict between Protestants and Catholics in political and economic terms: as a struggle between colonizer and colonized, ruling class and working class, oppressor and oppressed. His footage of street riots, police violence and firebomb attacks, shot on the fly and often at great risk, mingle with decades worth of newsreel footage. MacCaig called the IRA’s fight “certainly the most extensive, determined working-class struggle in Europe,” and The Patriot Game is an appropriately extensive, determined work of radical advocacy. After an early career spent directing avant-garde youth films and collaborating with fellow firebrands Nagisa Oshima and Koji Wakamatsu, Masao Adachi left his native Japan for Beirut, where he joined the Japanese Red Army. Prisoner/Terrorist, Adachi’s first film in 30 years, is a haunting amalgam of historical narrative, personal testimony, and poetic reverie. Imprisoned after participating in an airport massacre, an unnamed JRA member suffers a string of abuses, holds imaginary conversations with famous revolutionaries, and dreams fruitlessly of freedom. In René Vautier’s scathing critique of the Algerian War, several young French pacifists find themselves in a moral and geographic wasteland after being sent off to fight in the desolate Aures mountains. Set amid the dramatic rock faces of northern Algeria, Vautier’s film is a searing look at the horrors and injustices of colonial warfare. Midway through shooting, Vautier was rushed to the hospital after a bomb exploded beside him, lodging fragments of his own camera deep in his skull. They were never removed. For three days, a trio of filmmakers were given an audience with high-ranking members of the Weathermen—a militant faction of the Students for a Democratic Society that, after moving underground, committed itself to the violent overthrow of the U.S. government. At the time of filming, all five subjects were wanted by the FBI. We never see their faces, but their testimonies, set to a collage of clips from the era’s radical documentaries, provide a fascinating look at the mood, texture, and aftereffects of a volatile moment in the history of the US Left. A single-set color musical tracing the history of the West Indies through several centuries of French oppression, Med Hondo’s hugely ambitious magnum opus was at the time the most expensive African film ever made (it cost $1.35 million). A work of scathing satire and mirthful anger, West Indies has remained largely out of circulation since its premiere in 1979. It’s a story of Western oppression told with the stylistic flourishes of big-budget Western cinema, a distinctly African take on the Hollywood musical, and a one-of-a-kind film primed for rediscovery. Joseph Strick (adaptor of such un-adaptable novels as Ulysses and Tropic of Cancer) won an Academy Award for this searing series of interviews with five ex-GIs present at the infamous 1968 My Lai massacre. The men discuss their complicity in the crimes with remarkable candor, their testimonies circling around, hinting at, but never fully resolving a single, unanswerable question: what does it take to transform a group of responsible, dutiful Americans into mass murderers?